I am interested in investigating the nature of memory. My focus is on the evanescence of the virtual world that collides with the implacable resistance of physical life. Two current installations compare screen images that are fleeting and transitory to actual memory that is durable and reappearing. References to the way that I reflect upon the environment are presented with printed and constructed works in paper and electronic media. The places of mechanical and human elements in a postindustrial society are examined. The Words CAUTION: Appearance (Dis) appearance showing at the Laura Wagman Art Center, The University of the Arts in Philadelphia and UNDER CONSTRUCTION: Relay/Rewind/Record showing at the Dieu Donne’ Gallery, New York pose questions about how we transport materials - out of the era of the handmade object into the age of worldwide electrical energy network. The intent of the installation is to set up a chain reaction similar to my own response to a world of matter that has become a great nerve, altering our psychic condition. The works serve to awaken viewers to changes in the world’s eco-system and its affect on the human condition. Sine we process a vast amout of information electronically, our links with nature are being altered. I refer to elements of our past and future by imposing text on constructed works in paper and in sculptural environments, including video and computer images. The results are installation commentaries that gather the past to cope with the present. They explore the fact that since computers and the World Wide Web allow simultaneous users, we can live thousands of miles apart and still be connected by electronic means. A recent visit to a Texas pecan farm during harvesting prompted me to investigate various media to describe our common visual experiences of material transformation. Implied are the issues as to how we affect our fragile environment. 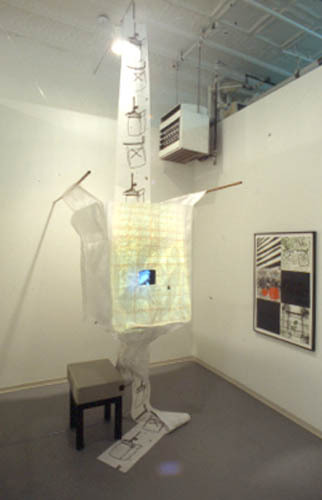 Serial lithographic images and a large harvest bag that houses a computer monitor probe human responses to cyberspace. My need to see things in reality, not just on computer or film screen is evidence of growing up in an ecological revolution – a time when anyone can travel infinite miles via the internet. The invisible structure underlying the worldwide electrical energy network, the various frequencies and magnetic waves are portrayed by various graphic elements. Manmade electrical components are imposed upon objects of a natural fibrous world to accomplish a projection style environment. If Microsoft facilitates 80% of all writing today, I pose the question of linkage where a society which can neither hear nor see the great changes going on. Visiting the sites of a small cottage industry such as a farm in Texas and on other occasions in India, the Czech Republic, Finland, Morocco, etc. feeds the way I sort out ideas, and the responses felt on these sites become building blocks of collective memories for the works. My own experience of working in small hand papermills and printshops in various parts of the world is constantly expanded and reshaped when I am on sites of this sort. Since my youth was a claustrophic experience, growing up in a railroad style apartment in a small town with four family members and a live-in grandparent, I have a desire for re-grouping interior spaces. Since I grew up in an ecological revolution, I am drawn to actualizing rituals to tell a story and make visual records about the environments I experience.